Our Direct line Under The Counter Ultra Violet Filtration System is a complete water purification solution for rain water that includes particle filtration to ensure that it reduces the mirco organism contamination while producing a crystal clean water. Ultra Violet (UV) light has proved to be very effective in destroying harmful bacteria and viruses in water. UV filtration provides a safe and simple way to ensuring your drinking water is of high quality. 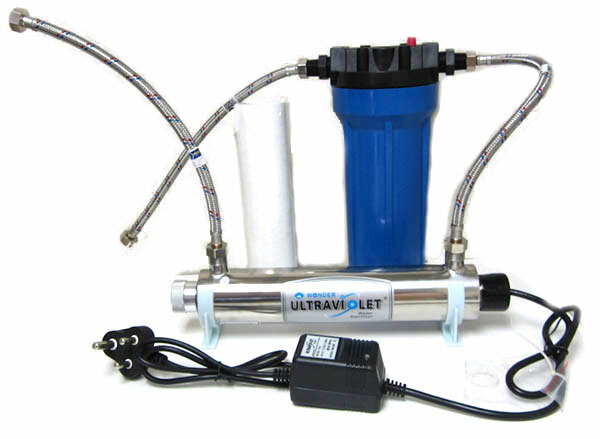 Our Direct line Under The Counter Ultra Violet Filtration System is a complete water purification solution for rain water that includes particle filtration to ensure that it reduces the micro organism contamination while producing a crystal clean water. The Ultraviolet Light bulb needs replacement once a year. Even though it may still appear to function well after this period, it will start to become less effective at killing bacteria and other micro-organisms. The system is designed with the assumption that proper rain collection such as Superhead Rainwater Tank Filter is used to source the water and that the water in the tank is controlled to avoid a high level of contamination. The Direct Line Under The Counter Ultra Violet Filtration System is connected to an incoming water source. The water flows through the system that cleans the water and is then poured out through your existing cold water tap at a chosen sink. (E.g. your kitchen’s sink). Adding a Premium KDF filters will remove any smells or tastes from the water. For more information on KDF and its benefits click here.